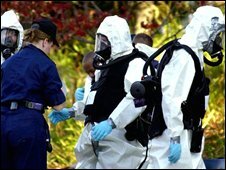 A US scientist who killed himself last week was the sole person responsible for the deadly anthrax attacks in 2001, new FBI papers allege. Dr Bruce Ivins alone controlled flask RMR1029, used in the attack, could not account for unusual overtime in labs and issued death threats, the FBI says. The anthrax-laced letters killed five people, made another 17 sick, and unsettled a nation traumatised by 9/11. Dr Ivins, 62, died shortly after being told he was about to be charged. The FBI had been under pressure since his death to reveal the details of the investigation and its papers were unsealed by a judge on Wednesday. FBI director Robert Mueller briefed the victims and their families about the case before publication. In a news conference later, the US attorney for the District of Columbia, Jeffrey Taylor, said: "We consider Dr Ivins was the sole person responsible for this attack." The papers say Dr Ivins had possession of anthrax spores with "certain genetic mutations identical" to those used in the sole deadly biological attack on US soil. Attorney Jeffrey Taylor says Dr Bruce Ivins was the "sole suspect"
The letters were sent to media offices and politicians a few days after 9/11. Mr Taylor said flask RMR1029 was "created and solely maintained" by Dr Ivins and that no-one could have had access to it without going through him. The BBC's Kevin Connolly in Washington says that although there is some hard scientific evidence, such as the flask, much of the case against Dr Ivins set out here is circumstantial. Dr Ivins worked at the army biological weapons laboratory in Fort Detrick, Maryland. 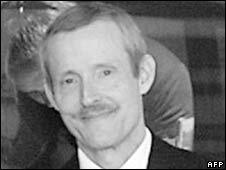 The investigation initially centred on one of Dr Ivins's colleagues, Dr Steven Hatfill. 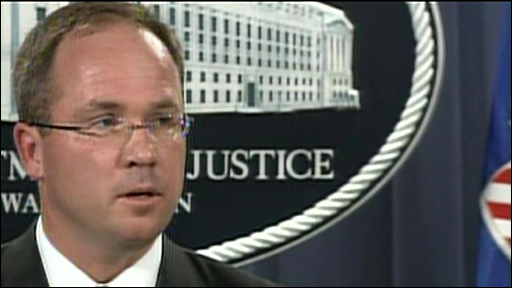 He later sued the justice department and won a $5.82m (£2.94m) settlement this June. The papers say Dr Ivins became the focus of attention in 2007. One affidavit in the papers says Dr Ivins reported to a co-worker that he suffered "incredible paranoid, delusional thoughts at times" and "'feared that he might not be able to control his behaviour". Dr Ivins also sent an email a few days before the anthrax attacks, warning Osama "Bin Laden terrorists" had access to anthrax, the FBI says. The email used language similar to that in the anthrax letters, it was alleged. Dr Ivins was also immunised against anthrax in early September 2001. The release of the papers coincided with a memorial service for Dr Ivins at his work place in Fort Detrick. Dr Ivins died in hospital on Tuesday last week apparently after an overdose. A lawyer for Dr Ivins said after his death that he had suffered "relentless accusation and innuendo", and that his innocence would have been proven in court. But a social worker said in filed court documents that Dr Ivins had "a history dating to his graduate days of homicidal threats, plans and actions towards therapists".